Approaching Ioujima on the first day. We planned to land briefly here before moving on a further 35km to Kuchierabu. Neither happened in the end. 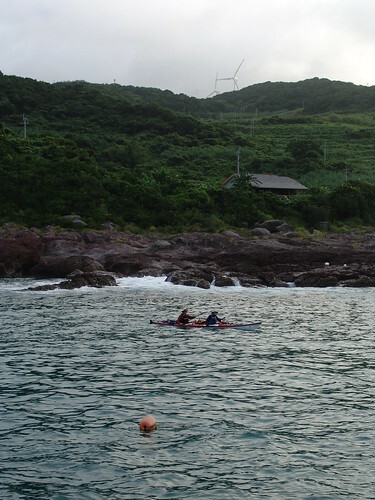 The sea was too rough even in the lee of the island and after, the current and wind were too strong so we set course for Yakushima instead, where we arrived after 99km and 17 hours of continuous paddling. On the second day, we attempted to go south around Yakushima's west side, but gave up the struggle after a few hours, having gained only several kilometers in that time. Turning around, we sailed using the Windpaddle's large size sail "Cruiser" at full speed to Anbo at the island's east extremity. 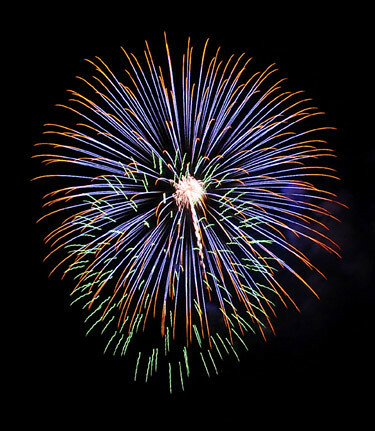 Soon after we set up camp in Anbo, fireworks exploded overhead, part of the local summer festival and eclipse anticipation party rolled into one. The display served as good practice for shooting with my new camera, under conditions somewhat similar to the eclipse itself. 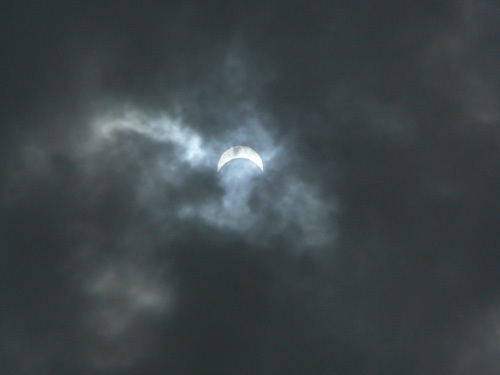 Thick clouds prevented observation of the total eclipse in Yakushima and all other nearby islands. Instead, I shot this 18-minute sequence of the moon's shadow passing over Anbo village. 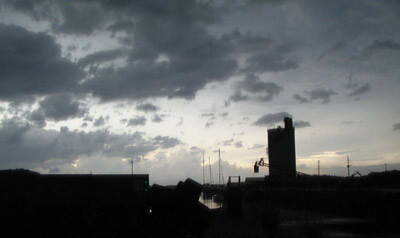 The darkness lasted for about 3 minutes. Even during deepest eclipse, light could be seen to the north since Yakushima was actually fairly close to the shadow's northern limit. Conversely, deep darkness prevailed to the south. 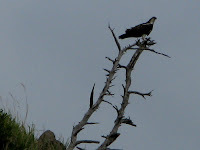 On the afternoon of the day of the eclipse, watching monkeys from the kayak on the shore of the Anbo River lightened up my mood and saved some part of the day I'd rued. 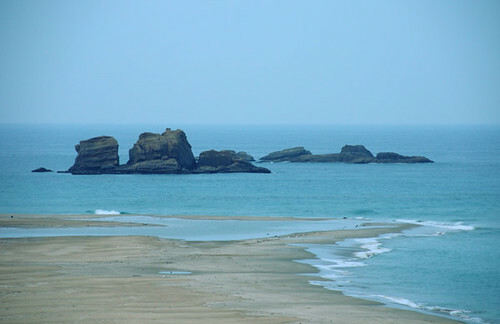 Our return trip used the long island of Tanegashima as a shield against the relentless Kuroshio current. We crossed a fast-flowing strait to Takezaki at the southern end of the island, where sandstone rocks emerge from the coastal flats, creating a unique landscape. Boat ramps such as this one at Takezaki serve as convenient landing and camping points for itinerant kayakers. In Japan, the overbuilt ports are for the most part sufficiently deserted, and kayakers few and far between, so it's rare anyone even notices, nevermind complains, about us being there. Tanegashima is best known for its space center, where most Japanese space shots take place. 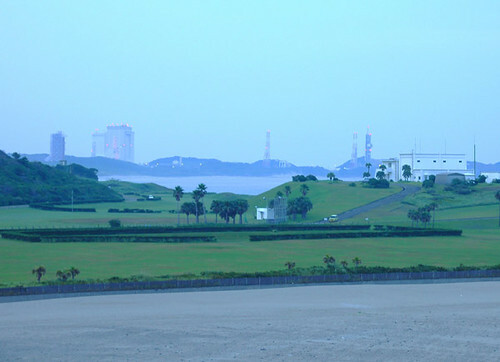 Although various related facilities are scattered throughout the island, the actual launch pads are located about 8km north of Takezaki. This picture of the complex was taken from a large viewing platform constructed specifically for public viewing of the launches. It might be pretty interesting to see a rocket go up into space from here. 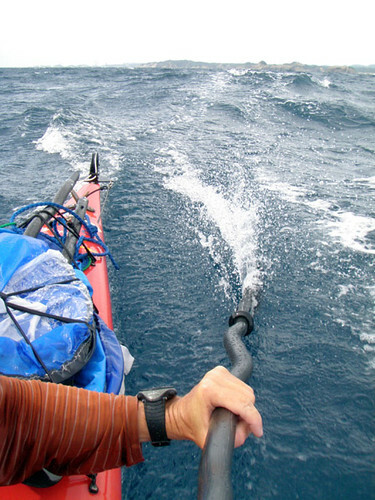 Top sailing speeds were achieved in brisk winds along the east coast of Tanegashima. In the stronger gusts, the GPS read over 20km/h. (In comparison, the usual paddling speed for our tandem was about 7km/h.) A burly stern rudder with the paddle was needed to take the weight off the boat's built-in rudder, which is not really built for such abuse. 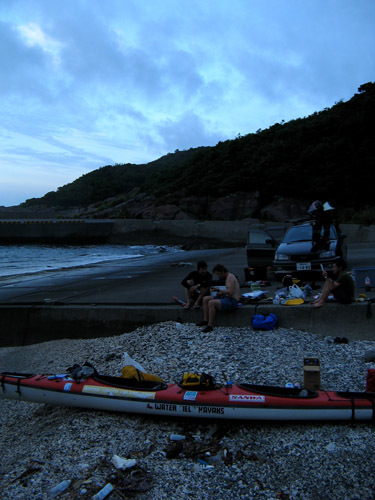 Having reached the north tip of Tanegashima in a day, we met with Jogo's friend Bun-san, a local surfer and kayaker. Chatting while staying over at his house made me want to spend more time with this interesting character who, among other things, has spent time hanging out with Canadian and American Indians. 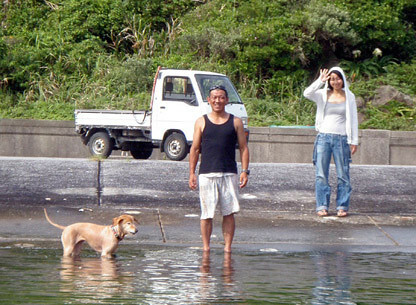 Here, Bun-san with his wife Kayo and dog Natsuki, give us a send-off as we depart Tanegashima to cross the 50-km-wide Osumi Strait. Bun-san has just completed a dugout canoe, made painstakingly by hand from a local tree that he also felled by himself. He is seen here with a friend during the first test-run of the craft at the local harbor, on the very same day we arrived. Jogo and I pause for a few minutes in the middle of the Osumi Strait to let a Panamanian container ship pass. The giant ship, probably coming from China, had already set course for the famous canal on the other side of the Pacific. 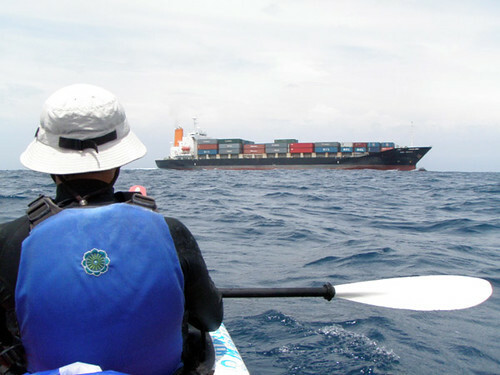 In another chance meeting an hour later, a Japan Coast Guard cutter passed within 300 meters of us without taking notice, proving again how inconspicuous a sea kayak can be on the sea, especially when half-hidden by choppy waves as we were. 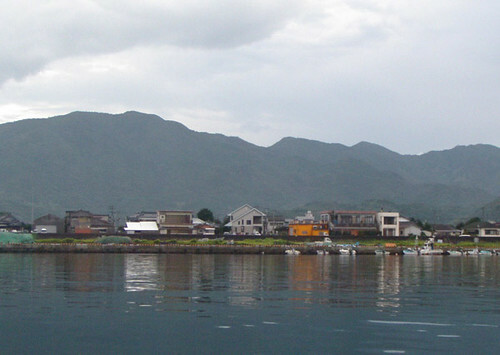 The tiny town of Uchinoura in Shibushi Bay on the southeast coast of Kyushu was our final destination. Crossing here from Tanegashima is not the shortest route to the mainland, but because of the vigorous currents within the strait, it is perhaps the fastest. In any case, we made good time, covering 50km of open sea in 8 hours. The final leg from Tanegashima to Kagoshima's Kimotsuki town was completed today at 18:19. Way to go guys. I (Leanne) will be driving in the rain all night with Mr.Mizuno to pick you up and hopefully go for a casual kayak tour over the weekend. It looked like it must have been a rough and exciting final ride. I can't wait to hear all about it. Do you want to follow this expedition on your own through the SPOT service (it's free!)? If so click here for live updates. 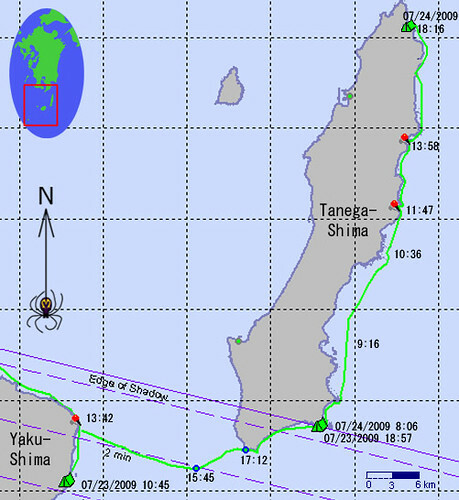 The expedition left Tanegashima at 8:40 this morning. 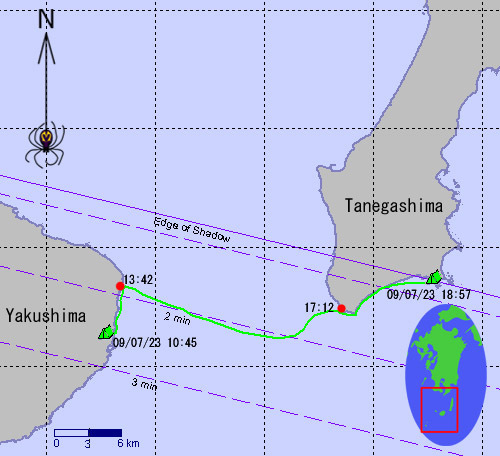 At 8:25, the Tanegashima lighthouse measured winds of 9m/s SW. The radar shows the area to be clear at the moment, but it looks like there could be showers throughout the day. With this favourable wind, I'm sure they will be using the Windpaddle Sail to power their trip home. Radar image at 12:20. Looks like a thunderstorm could pass through before they make landfall. This map was made using data compiled from the SPOT tracking unit. Today looked like a great day for touring up the east coast of Tanegashima. This morning, at 8:20 the wind was measured at the Tanegashima lighthouse as 5m/s SSW. At 14:25 the wind was recorded as very light. 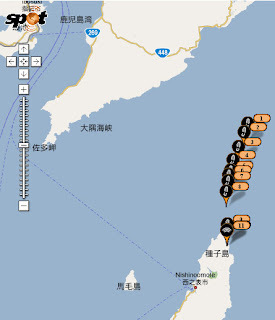 According to their SPOT records, it looks like they have finished kayaking for the day. 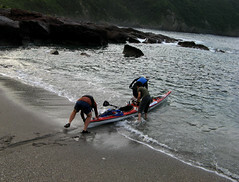 The Japanese Surf Kayak team left Japan for Portugal earlier this week. I'm sure they are all there now enjoying the waves and adjusting to their environment. The World Championships will be held between July 23rd and August 2nd, 2009. Good luck to the Japanese team, especially our Kumamoto surf kayak hero- MATSUMOTO! 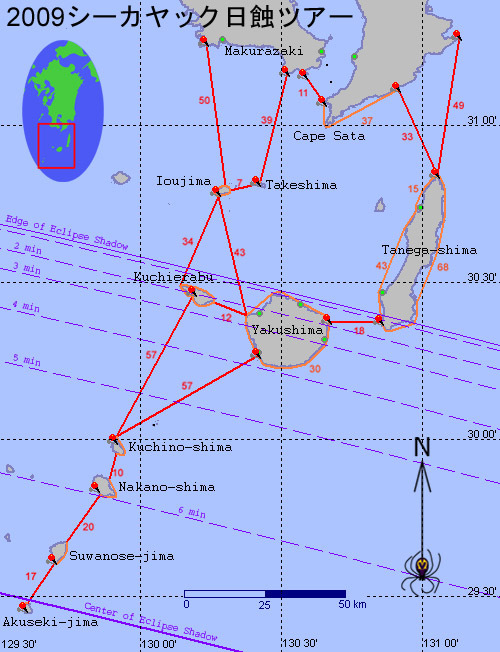 Conditions look good for a simple crossing to Tanegashima. 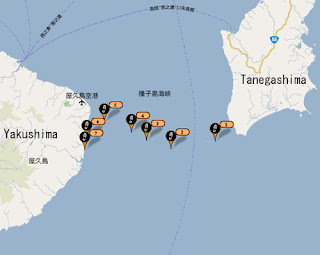 According to the latest SPOT tracker, Rik and Jogo are just off the south west coast of Tanegashima. At 16:25 the wind was measured at the Tanegashima lighthouse as 3m/s SSW. I will update the blog tonight with more details. It looks like the team is on the go. Currently (9:45), I am tracking them with the SPOT unit and they appear to be moving north up the east coast of Yakushima before they make the crossing to Tanegashima. picture taken by Mihoko in Amakusa, July 22nd, 2009. Well, the big day is over and what an event it was, at least for us here in Kumamoto, Kyushu. (article in the Canadian press). As predicted, it was raining in Yakushima (Rik and Jogo's location during the eclipse) and it was beautiful and sunny in Amakusa (the support team's location during the eclipse). This morning I had a great early morning surfing session at KDD in Reihoku followed by an even better solar eclipse viewing. I was incredibly moved by the images I saw through my black viewing lenses. 感動しました! It was so fun to share the experience with a friend, some other surfers and even a local grandma. "The eclipse was a write-off as expected though it was interesting how it got dark. i grabbed one picture through the clouds of the partial phase right near the end. thats the most i could do. the news is that except for ogasawara it was all dame(Japanese for a write-off) in this area, tokara, amami, etc." Tanegashima, a long and narrow island is historically famous in Japan as the island where Portuguese merchants first arrived in 1543 quickly introducing guns and Christianity. At present, Tanegashima is reknown for the Tanegashima Space Center (TNSC), supposedly the most beautiful rocket-launch complex in the world. Rise and shine! おはようございます!The current radar is showing heavy rain storms moving steadily over southern Kyushu. 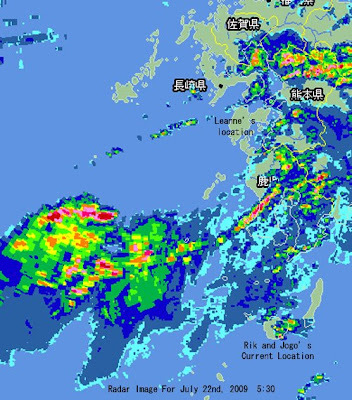 Yakushima could be missing the worst of the showers, but at present it is raining there. Amakusa looks like it is in the clear, atleast for now. 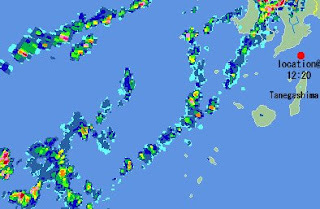 According to Windguru in Yakushima there will be rainfall throughout the morning with a slow clearing trend. Let's hope that the rain moves through sooner than expected! The Coast Guard's wind records show 16m/s winds currently at the Kusagaki lighthouse. I'm off for a morning of surfing and hopefully eclipse viewing. yipee. As I go to publish this and start packing up to go surfing, guess what, a shower is passing through. another look at the radar shows a band of showers passing right over Amakusa. Looks like it is going to be a hit and miss kind of day.サーフに行くための準備をしようとすると大雨が突然降ってきました。レーダーをも一回見ると現在天草も屋久島も雨! I just got off the phone with Rik and he said that it was so humid that there were raindrops falling out of a clear sky. The weather forecast is still looking bleak for tomorrow, but after a lot of careful thinking, they decided to stay on the east coast of Yakushuma in Anbou and hope for the best. Rik figures that with the prevailing westerly winds, the rainshadow of the mountains on the east coast may be the best place to view the eclipse. In Amakusa, things are looking better with forecasts for partially clear skies tomorrow. I'm going to go surfing, and hopefully enjoy the eclipse in Reihoku. 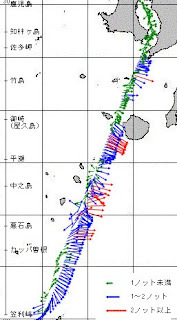 According to the Japanese Coast Guard wind measuring device, today at 11:25am in Kusagaki, the wind speed was 13m/s SW. This unfortunate wind direction and strength has grounded the progress of the Eclipse Expedition. 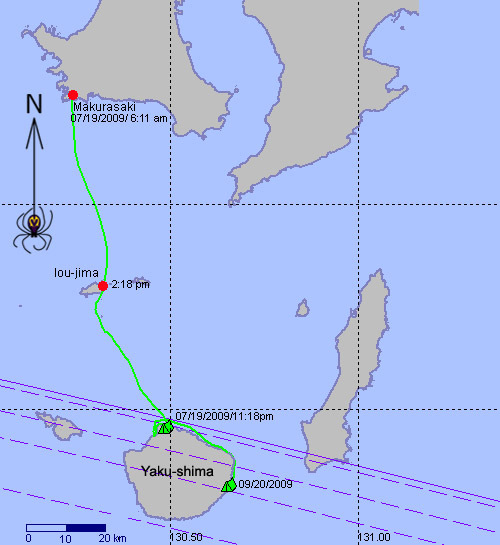 Rik and Jogo are now landbound on the East side of Yakushima near Anbou. They will camp there tonight and will attempt to view the eclipse tomorrow morning. Currently the weather forecast for tomorrow is for storms passing through the area accompanied by rain showers. A fully loaded car: a double kayak, two single kayaks, 4 people, equipment, and over 50L of water. Final strategy planning on the dawn of the first day of the expedition. 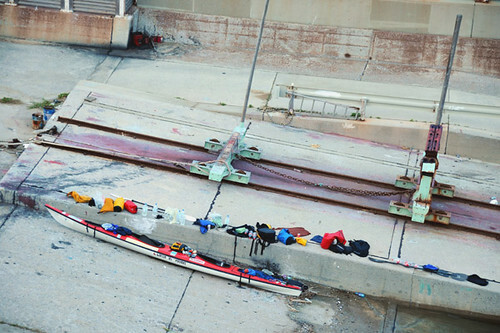 Giving the loaded kayak a good push. The boys are safely enjoying the comforts of their tent after another hard day battling the strong winds and rough seas. 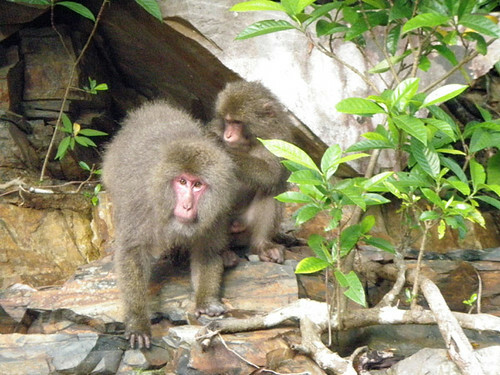 According to the SPOT tracking unit, they are camped out near a port in Anbou, Yakushima. 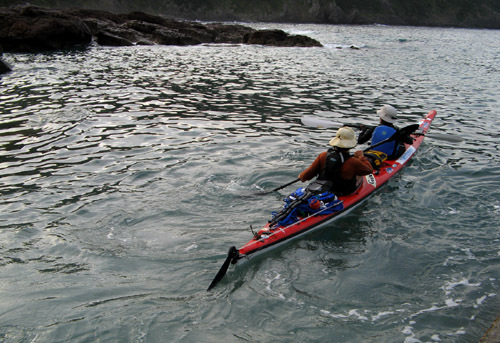 The inial plan to kayak all the way to the Tokara Islands has been scraped due to bad weather. The weather forecast remains unfavorable for the eclipse with cloud cover and rain predicted throughout the day. Still, they will remain in Yakushima until the 22nd with hopes that the weather will change and they will be able to view the eclipse. Tomorrow I will upload a map of their progress along with some pictures. 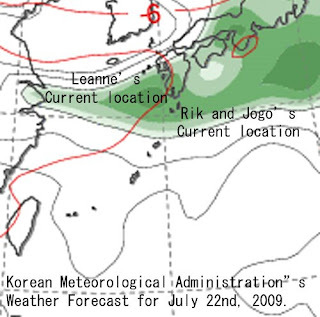 Last night, July 19 23:45 Jogo and Rik made landfall in Yakushima. After kayaking for over 100kms in approximately 17 hours. way to go guys. the support team is still on the road in Kagoshima and will be updating this blog in more detail later on tonight. 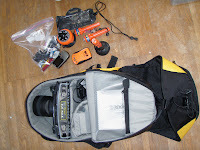 We just finished packing everything into waterproof bags, and now we are heading off to work. Tonight we will be leaving for Kumamoto City where we will be picking up and loading the tandem kayak onto our friend's car and then driving to Kagoshima. We will be meeting up with Jogo in Makurazaki, where Rik is hoping they can get an early morning start to the expedition. Currently the weather forecast looks depressing, but it's still early and things can still change. Let's all pray for good weather and a great journey! I'll be back with an update on Monday night. この地図は遠征海域の色々なポイントの間の距離を表します。現在予備予定で枕崎の周辺を出て、硫黄島・口永良部島経由トカラの口之島まで。帰りは黒潮の流れを有利に使って、屋久島・種子島を通って大隈半島です。 A map outlining the expedition's preliminary plans, showing distances in kilometers between various strategic points. We plan to leave Kyushu near Makurazaki and head toward Tokara's Kuchinoshima via Iojima and Kuchierabu-jima. On our return, to use the Kuroshio current to advantage, we will pass Yakushima and Tanega-shima toward an eventual landfall somewhere on the Osumi Peninsula. On July 22nd 2009, there will be a total solar eclipse lasting up to 6 minutes and 39 seconds. 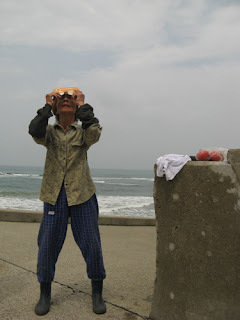 The Tokara Islands are one of the best places in Japan to view the eclipse. 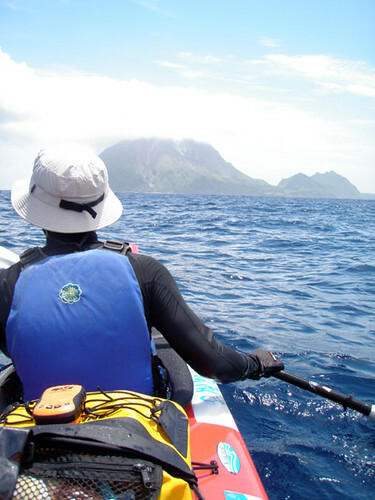 Rik and Jogo, an acclaimed kayaker from the Kansai area will travel together in a tandem kayak from the mainland of Kyushu to the Tokara islands. 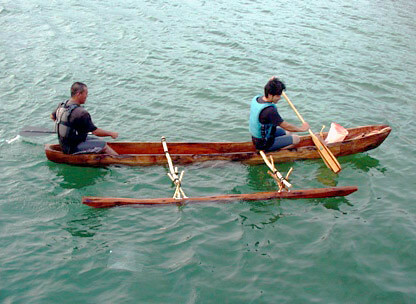 They will be paddling a Japanese made tandem kayak generously supplied by Waterfield Kayaks. SPOT Satellite GPS messenger technology will be used to track the progress of the expedition. This blog will be updated daily with their progress.